The Nissan GT-R is a 4000 lb, all wheel drive car, that is the first use of a dual clutch transaxle(GR6) in a production car. At least that is what some press release somewhere said. In the 2009 model year the GT-R was making 480 horsepower and running high 11's in the quarter mile. For 2013 they are making 545 horsepower and running low 11's in the quarter mile. Like most performance cars, if some is good, a lot more is much better. In the case of the GT-R, 1000+ horsepower is the new 500 horsepower. With this much horsepower and torque, the driveline starts to show some of its weaknesses. 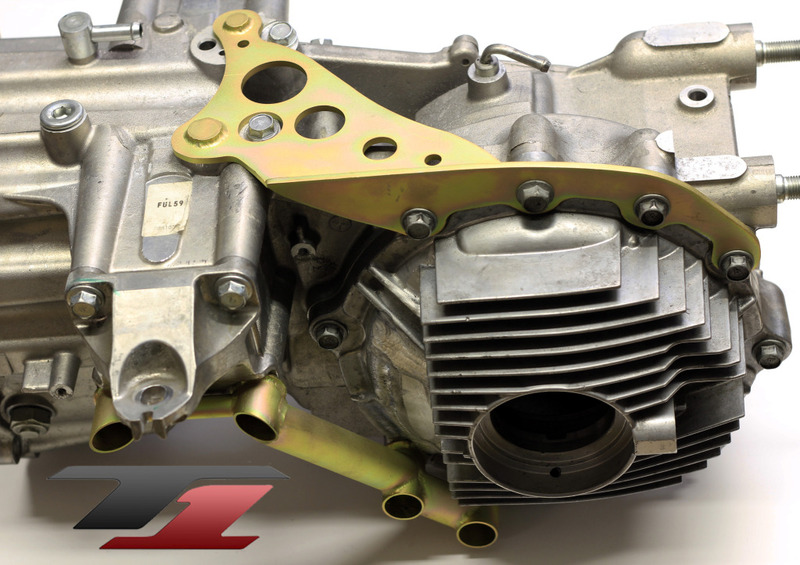 Under big power, the differential tries its best to separate from the rest of the transmission. Aluminum castings for the differential are not as strong as cast iron, for 500 horsepower this works out great for weight savings, not as good for drivetrain life. T1 Racing has addressed some of the problems associated with the Nissan GT-R's differtransmissiontransfercase, by producing a stiffening brace. T1 is now offering upper and lower transaxle braces that are designed to tie the differential area of the housing to the front half of the housing by tying the strong points of each half together and eliminate flex. 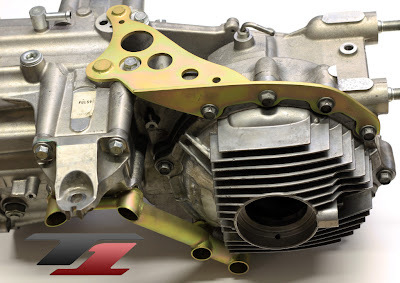 With hard launches and wheel hop, many GTR owners have also broken the transaxle case at the rear differential location. Under extreme loads, the differential housing literally tries to separate from the front half of the case. 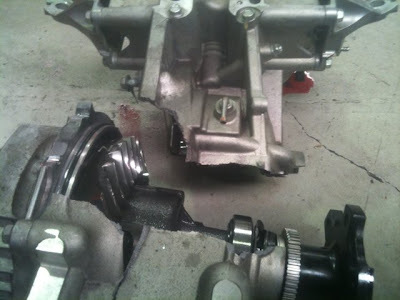 The result is a destroyed transmission case that you cannot buy from Nissan. The only replacement option is a new transmission, which comes in at over $13,000. So the choice is yours, you can either brace yourself for the repair bill, or brace your transmission and keep on moving. Next up for broken parts are axles. 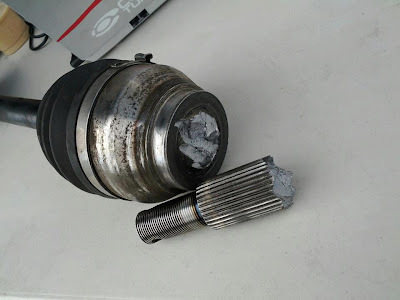 The wheel hopping nastiness of an LC1 launch did some damage. If the differential isn't going to snap off the end of the GR6, then the axles start to become two piece. Hing/SP/Greddy did some 8 second passes with stock axles, but they also snapped two of them on the way to their 8.79@167 mph pass. The car that beat that time used Driveshaft Shop Axles, and ran a 8.62@173.8 mph quarter mile. 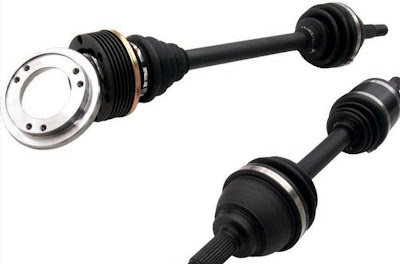 The Driveshaft Shop has focused their years of expertise on the GTR and is now offering solutions for both front and rear replacement axles. Up front, the Level 5 front axles address the weakest link by upgrading the center bars from the small stock 27 spline to larger 36 spline bars made from high quality aerospace grade material. These axles feature a direct-fit outer CV made from a proprietary material, billet inner CV and spline plug into the differential on the male side and a Porsche-style 108mm inner with precision machined adapter plate to mount to the drive flange on the opposite side. These axles are capable of harnessing 1000hp and can be used for street or drag with no modifications required. The GT-R Pro-Level Rear Axle Kit features a direct-fit outer CV made from a high-grade proprietary material, as well as Porsche-style 108mm CV's on both ends (which have been upgraded to use DSS’ signature 30 spline bars with billet 4340 cages). The ‘anti-wheel hop’ design of these axles employs different diameter aerospace-quality torsional center bars that let the axle wrap-up and release at different rates , allowing them to absorb a great deal of the shock and minimize wheel hop considerably. The axle kit also includes precision billet adapter plates with hardware to mount to the factory differential stubs.